Yousafzai's story "is certainly helping us to promote education in the tribal belt," Muhammad Atif Khan, the province's education minister, told Bloomberg News. "Education is a matter of death and life. We can't solve terrorism issues without educating people." KP government has raised school funding by 30% to accommodate the surge. 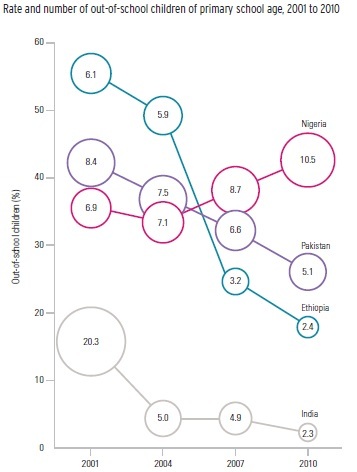 Pakistan's literacy gender gap of 29% is among the worst in the world. KP province, which includes Malala's home in Swat Valley, is the main contributor to it. In spite of the right-wing backlash against Malala's recognition in America and Europe, it seems that little girls and their parents see Malala as a great role model. Both private and public schools are seeing a flood of new students, according to Ahmad Shah, the chairman of Private Schools Management Association, an organization that represents 500 schools in the area. Bloomber reports that his school has seen a 10 percent rise in admissions this year, the most since the Taliban's ouster. "In our schools, girls are saying I want to be like Malala," Shah said. "They are relating themselves with her in many ways." Pakistani mass media have also joined in the campaign by showing Malala as a positive role model. GeoTV has extensively covered events surrounding Malala's Nobel prize nomination and book launch, including her many interviews in English, Pashto and Urdu. Burka Avenger, a new Geo TV animated show, features a female teacher superhero who uses the power of books and pens to defeat opponents to girls education. In her speeches, Malala has repeatedly talked about the power of the books and the pen to defeat terrorists in Pakistan. Malala Yousufzai is a great role model for Pakistani girls. Regardless of the motivations of the West in promoting her, it's good to see the positive impact from the Malala phenomenon. Let's hope it helps dramatically reduce the high number of out-of-school children in Pakistan. Israr Gandapur murder; Malala and child education in Pakistan; Iran-US negotiations from WBT TV on Vimeo. Viewpoint from Overseas host Faraz Darvesh discusses with Riaz Haq (riazhaq.com), Sabahat Ashraf (iFaqeer; ifaqeer.com) and Ali Hasan Cemendtaur Israr Gandapur’s murder over Eid and PTI’s continued sympathies for Taliban; Malala Yousafzai’s rise to fame and its impact on child education in Pakistan; and Iran-US negotiations. This show was recorded at 1 pm PST on Thursday, October 17, 2013. It is due to "Parho or Zindagi Badlo" Campaign started by Imran Khan himself about 40 days ago...PTI are the pioneers of such positive changes. All other monkeys jump on the bandwagon afterwards to take credit. ImranPTI: "It is due to "Parho or Zindagi Badlo" Campaign started by Imran Khan himself about 40 days ago...PTI are the pioneers of such positive changes. All other monkeys jump on the bandwagon afterwards to take credit." So you know better than the KP education minister, himself a PTI man, who attributes it to Malala? And the parents? and the school association chair? #KP's economy worsening on #PTI's watch. Investors, businesses leaving in droves. Literacy rate for girls stands at a modest 10.5% compared to 36.66% for boys despite considerable expenditure incurred by the FATA Secretariat to improve education statistics in the Federally Administered Tribal Areas (Fata) and Frontier Regions (FRs). According to the Annual Development Programme 2013-14 for Fata, Rs3.68 billion has been allocated for education, of which Rs2.8 billion is being used for 184 ongoing schemes while Rs877 million will be used for 33 new schemes. But the literacy rate for the area still stands at only 24.5% even in wake of significant expenditures made by the FATA Education Department. According to the FATA Education Atlas 2011-12 report released by Directorate of Education FATA Education Management Information System, the proportion of girls enrolled in educational institutions stands at 7.5% in South Waziristan, 4.26% in North Waziristan, 21.03% in Kurram Agency, 4.75% in Bajaur, 5.72% in Mohmand Agency, 5.15% in Orakzai Agency and 16.13% in Khyber Agency. Similarly, the proportion stands at 5.88% in FR DI Khan, 1.81% in FR Lakki Marwat, 2.28% in FR Tank, 1.07% in FR Bannu, 24.09% in FR Kohat and 16.66% in FR Peshawar. what is the unemployment rate? If market is flooded with young people, but there are no jobs, how will it play out? Anon: "what is the unemployment rate? If market is flooded with young people, but there are no jobs, how will it play out?" Pakistan led job growth in South Asia from 2000-2010. The percentage of women in work force has doubled from 11% in 2000 to 22% in 2010 in Pakistan. Education is the ladder that helps men and women climb out of poverty into middle class. Ms. Yousafzai, 17, is the youngest recipient of the prize since it was created in 1901. Mr. Satyarthi is 60. The $1.1 million prize is to be divided equally between them. Malala received the " US Liberty Award", yet another honor today after the Nobel Peace Prize. The more honors the West heaps on Malala, I'm afraid the greater will be the suspicion in Pakistan about the West's motives. As someone described it recently, its the "white man savior complex" at play here..a extension of Kipling's "white man's burden" to civilize us savages whom they ruled as our colonial masters. To me, the real test of Malala's contribution should be measured by how many girls she inspires to go to schools...girls who would not have done so otherwise. Arundhati Roy’s charm and lucidity have iconized her in the world of left-wing politics. But, asked by Laura Flanders what she made of the 2014 Nobel Prize, she appeared to be swallowing a live frog: “Well, look, it is a difficult thing to talk about because Malala is a brave girl and I think she has even recently started speaking out against the US invasions and bombings…but she’s only a kid you know and she cannot be faulted for what she did….the great game is going on…they pick out people [for the Nobel Prize].” For one who has championed peoples causes everywhere so wonderfully well these shallow, patronizing remarks were disappointing. The delivery of education services is a very important and much talked about topic in Pakistan. This article attempts to challenge the myths associated with this topic. The focus of this article is government schools in Peshawar. The three main features of the delivery of educational services are: 1) to increase access of all schoolgoing age children to school; 2) to improve the quality of education delivered; and 3) equity – to provide educational services to all children without discrimination. 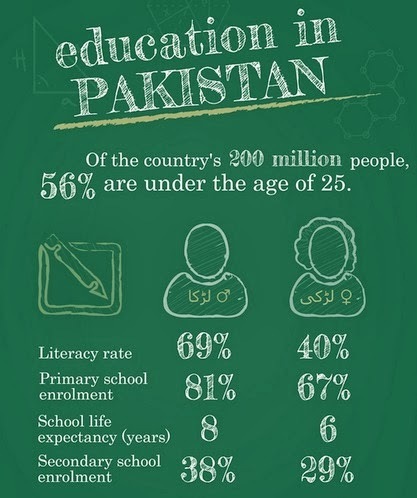 In Pakistan, approximately 75 percent children attend government schools, while 25 percent attend private schools. The quality of education provided in government school is generally rated as poor. Equity in government schools is a non-issue because government schools are generally meant for the economically less advantaged class of society. Myth 1: Financial allocations for the education sector are low and increased allocation will automatically improve the standard of education. Each province of Pakistan allocates around 40 percent of its annual budget on the standard of education; in Khyber Pakhtunkhwa it reached around Rs70 billion in 2014-15. Moreover 50 percent of employees in each province belong to the education department. Despite this huge investment in education, the required educational results are not achieved. One indicator is examination results. An analysis of the results of the matriculation examinations of the Peshawar Board of Secondary and Intermediate examination in the year 2008 reveals that among 20 top position holders, not even one was from a government school, although 80 percent students in the province attend government schools. Students from private schools got higher grades (97 percent A1, 78 percent A, 47 percent B), Government school students got a higher numbers of low grades (89 percent D, 78 percent C and 53 percent B). Although private schools receive no government funds and also pay taxes, their examination results are far better than government schools. Increases in allocations don’t automatically improve the delivery of educational services unless mismanagement of funds is controlled. Singapore developed a world class education system by the most productive use of four percent of its GDP allocations. Myth 2: Students are young and their opinions don’t matter. Students are important education stakeholders and the education system is meant to develop the younger generation into useful citizens. Therefore, their opinion needs to be considered while bringing about education reforms. A survey was conducted in 2008 in Peshawar to gauge the satisfaction level of stakeholders (teachers, students, parents, education officers, and politicians) in government schools. Stakeholders showed only 28 percent satisfaction level towards the delivery of education services. Students showed the highest level of dissatisfaction among all the stakeholders. Students were interviewed in their classrooms at the primary, middle, and high school levels. They complained that teachers don’t teach in classrooms and spend more time chatting with other teachers. Education officers on monitoring visits to schools spend time in the principal’s office. Myth 3: A uniform education system will improve the delivery of education services. In Pakistan, three parallel educational systems run parallel to each other. The very underprivileged class attends madressahs, the underprivileged attend government schools, and the middle and richer classes attend private schools. There can’t be a uniform system unless class difference is removed. government schools are ostensibly free for the user, while private schools typically charge fees. percent of the average household income in both rural and urban areas.